Okay, I can’t take full responsibility for the catchy title. Man Repeller recently published a post on wearing knee-length skirts when you hate them. Knee-length skirts do remind me of high school, but what’s worse in my book are plaid shirts. I won’t go on about how horrible they are. In five words, they make me look boxy. Or one: unflattering! But I love a challenge. And so, I recently bought a plaid shirt. Is there such thing as a flattering plaid shirt look for a pear/curvy shape? I’ll let you decide. Now I’ll be honest with you. We did this shoot in California, and I was freezing. Once we finished, I pulled on a short fitted jacket and a long wool coat. This is, however, what I wore indoors. As you can see, it’s quite suitable for indoor temperatures, with my plaid shirt layered over a long-sleeved top. My legs also stayed warm with over-the-knee boots under a silk A-line skirt. I love the look of this plaid top with the rest of the outfit. That is, since I like blending styles and textures. 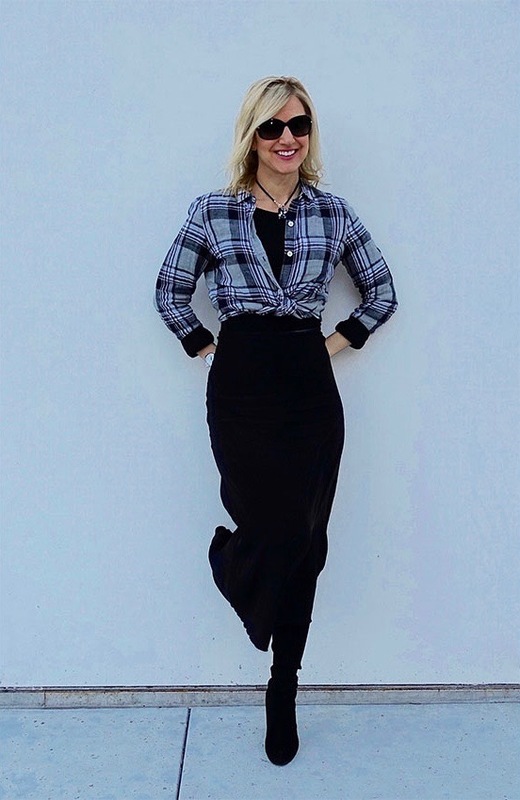 I’m not one to dress a la grunge or lumberjack, but plaid gives my look a more laid-back vibe. I also discovered a nifty trick of using the sleeves of my long-sleeved (under layer) top as a cuff to secure my rolled-up shirt sleeves. As for finding a flattering way to wear the plaid shirt, I relied on keeping the bottom unbuttoned and tying it in order to define my waistline. The high-waisted A-line skirt was also a big help. You can’t tell where my waist and hips actually are – and so, it creates a super slimming, long-legged silhouette. In contrast, when I try this plaid shirt on – notice I don’t say wear! – with just jeans or trousers, my silhouette gets cut in half. On the top, my slimmest area is hidden by this awful rectangular shape, while attention is drawn to my hips, and…let’s just say it’s not pretty. The rectangular/square pattern of the plaid even seems to accentuate the boxiness. Not a problem. Here are some alternatives to that look. If you’ve been avoiding plaid shirts because they just aren’t flattering, I hope that I’ve given you some ideas to get back on that horse. That is, if you – like me – don’t want to be barred from this classic shirt style. Do you wear plaid shirts, and if so, what is your favorite way? These are great tips. I bought a plaid shirt a few weeks ago and can’t wait to wear you. Love how you look in these, my dearest! Love how you’ve styled this! You have amazing style; I love your shoes. Thank you! These boots are so comfy and warm for winter – I highly recommend them. Lovely look and tips. Love the way you tied your plaid shirt.